Home » What are the Most Common Causes of Accidents On Board Ships? While regulations have been introduced and implemented in the shipping industry to help make workers safer, there are several types of maritime accidents that seafarers are susceptible to and must be made aware of so they can take preventative measures. Man overboard – A man overboard situation is somewhat common and occurs when a person falls into the water while working or as a result of an accident. The best bet for every crewmember on board is to always wear a personal flotation device. Also, be aware that bad weather has been known to either cause a man overboard accident or spoil rescue operations. Additionally, maritime workers must factor in the dangers of hypothermia. Enclosed space accidents – Particularly aboard larger ships, enclosed space accidents most often occur when a crewmember enters a confined space that is not gas-freed and still has pockets of either toxic or flammable gases. Risk assessment is one of the most important steps to take before entering any enclosed space. The space must be well ventilated before entering and fire hazards must be minimized beforehand. Machinery malfunction – Machinery that is not properly maintained can lead to explosions. This can include compressor blasts, boiler blasts, crankcase explosions and other types of accidents. Mooring accidents – Mooring operations is a tasks that can be dangerous if the worker does not have the proper skills and knowledge prior. Any crewmembers that are mooring must be properly trained beforehand and have an understanding of what the snap back zones and rope bights are. Slip and fall accidents – Slip and fall accidents occur when surfaces on board a ship are not treated with anti-skid material. Additionally, these accidents occur when ships can have poorly marked areas, a lack of railings or nets, poor lighting or loose lines. Being aware of the dangers on board a ship can help workers learn how to avoid them. If you have sustained an accident while working at sea, you are protected by the Jones Act and may be entitled to compensation. 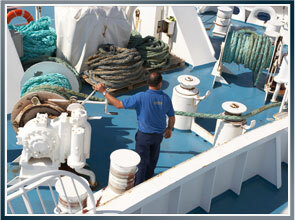 Consult with an experienced maritime attorney immediately to determine what your rights are moving forward. David Anderson is a maritime accident attorney at Latti & Anderson LLP. We offer free consultations on maritime accident cases nationwide. Previous Are Tourist Boats Safe?